What do we know about Gaspar Llamazares? For a start, we know he’s a Spanish politician, a former Communist party member and leader of the leftist coalition Izquierda Unida. We know he has a Masters in Public Health from the University of Havana. We know he once attacked the Pope for his stance on contraception in the developing world. And now, thanks to the FBI, we also know that he bears more than a passing resemblance to a 53-year-old Osama Bin Laden. 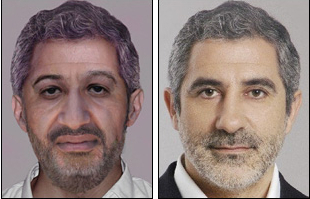 This most recent fact about Llamazares came to light this week when the bureau published a computer generated photograph of what Osama Bin Laden – 9/11 mastermind; cave-dweller; last remaining user of audio cassettes – might look like today. The photograph, we were told, was produced using the FBI’s special digital aging software, the technical brilliance of which we could only dream about. One is led to imagine gigantic whirring super-computers, surrounded by federal agents in white coats, feeding in old Bin Laden family snapshots, screen-grabs from his video messages; perhaps even trimmings from his beard. Then, when the miracle machines have done their work – after weeks of computation, burning through enough energy to light the whole of Holland – a printer whirs into life, rendering a single wanted poster-sized image. The current face of evil. No wonder the bureau was proud of the photograph, posting it on their website and distributing it to the world’s media, from Minnesota to Madrid. And no wonder Gaspar Llamazares was shocked – no, terrified – when one of his friends pointed out that the resulting photo was his spitting image. What were the odds? A million to one? A billion? In fact, as the FBI were later forced to admit, one of the things their super-computers aren’t very good at drawing is beards. Or hair. Or noses. Or faces, really. So the poor agent tasked with producing the image did what any of us would do when faced with an impending deadline and a multi-million dollar operating budget: he fired up his laptop, went to Google images, found a photo of someone who looked a bit Bin Laden-y, copied his features onto the photograph, added a few wrinkles and hit ‘print’. Unfortunately for all concerned, the face donor turned out to be a high profile Spanish politician – a politician who is now, quite rightly, worried that he’ll be lynched if he ever sets foot in the USA. It goes without saying that the incident raises a couple of pretty serious questions. For a start, what precisely did the FBI agent type into Google image search to find someone with similar features to an older Bin Laden? ‘Sinister middle-aged guy’? ‘Swarthy foreigner’? Presumably not, as the former brings up a photo of Liam Neeson while the latter returns Borat. More worryingly if the FBI’s cutting-edge photo aging technology is nothing more than a kid with a laptop, an Internet connection and a copy of Microsoft Paint, then what else are they lying to us about? It’s bad enough that we have the ‘CSI Effect‘ – the phenomenon, resulting from the popularity of TV shows like CSI, where the public and criminals have unrealistically high expectations of what crime-fighting technology is capable of. But TV shows are supposed to lie to us. Finding out that the government is playing the same game – massively exaggerating their technical abilities in order to give us comfort and to terrify our enemies – is just weird. Particularly when they’re doing it using our tax money. Fact: Civil rights campaigners can relax. We’re told that the scanners’ operators are hidden away in a special room to protect our privacy – but according to our source, the reality behind the curtain – as with the Wizard of Oz – is far less exciting. There are no full-body scanners, just one very pervy dude watching CCTV and using his warped imagination to sketch the people he sees, sans clothes. Yes, it’s still freaky – but for an entirely different reason. How to avoid being unfairly caught: Be one of the Osmonds. No one wants to imagine the Osmonds naked. Fact: We’ve all stood at immigration while the TSA agent takes our passport and swipes it through their special scanner. But, with the monitor facing away from us, we’ve all wondered precisely what information is being displayed about us. Our police records? Details of where we’ve travelled? Perhaps our name is being checked against some kind of terrorist watch list (see below). Wrong on all counts. In fact the scanners simply are simply accessing our Facebook profile to check whether we’re friends with Osama Bin Laden. If no, welcome to America. If yes, next stop Cuba. How to avoid being unfairly caught: Don’t accept a friend request from Gaspar Llamazares. Fact: The FBI, NSA and CIA have all tried to build relationships with their foreign intelligence counterparts to build up an accurate list of international terrorists. Unfortunately, America’s aggressive foreign policy has driven much of the middle east into a sort of diplomatic sulk, with many Arab countries either refusing to pass on data or even occasionally creating fake names for their own amusement (the latter resulting in the arrest last month of Messrs ‘Pat Downe’ and ‘Ben Dover’ at Chicago O’Hare airport). In fact the government’s current no-fly list was compiled simply by buying the subscription lists of ‘Jihad Monthly’, ‘Death To America! Digest’ and the Guardian. How to avoid being unfaily caught: Only buy your copy of Jihad Monthly at the newsstand. Fact: Bombs just happen to smell like Snausages.